September 8, 2017 (Tony Cartalucci – NEO) – With the recent attack on police in Myanmar by terrorists described by Reuters as “Muslim insurgents,” and ongoing terrorism plaguing the Philippines where forces are engaged with militants from the so-called “Islamic State,” it would appear that terrorism has spread into Southeast Asia with no signs of waning. However, the sudden uptick in violence comes at a time when America’s so-called “pivot to Asia” has ground to a complete halt, providing the United States with an all-too-convenient pretext to reengage and establish itself across the region in a much more insidious manner. The United States has openly conspired to establish and expand a permanent military presence in Southeast Asia as a means to confront, encircle, and contain China for decades. As early as the Vietnam War, with the so-called “Pentagon Papers” released in 1969, it was revealed that the conflict was simply one part of a greater strategy aimed at containing and controlling China. While the US would ultimately lose the Vietnam War and any chance of using the Vietnamese as a proxy force against Beijing, the long war against Beijing would continue elsewhere. More recently, an American policy think tank, the Project for a New American Century (PNAC) in a 2000 paper titled “Rebuilding America’s Defenses” (PDF) would unabashedly declare its intentions to establish a wider, permanent military presence in Southeast Asia. 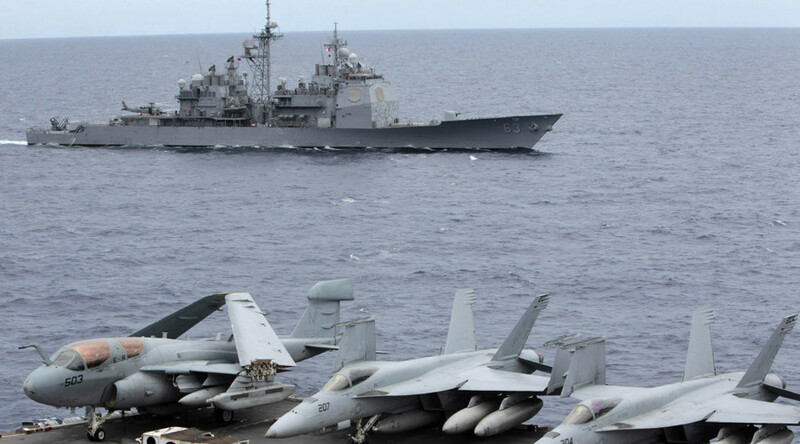 …it is time to increase the presence of American forces in Southeast Asia. In Southeast Asia, American forces are too sparse to adequately address rising security requirements. Since its withdrawal from the Philippines in 1992, the United States has not had a significant permanent military presence in Southeast Asia. Nor can U.S. forces in Northeast Asia easily operate in or rapidly deploy to Southeast Asia – and certainly not without placing their commitments in Korea at risk. Except for routine patrols by naval and Marine forces, the security of this strategically significant and increasingly tumultuous region has suffered from American neglect. This will be a difficult task requiring sensitivity to diverse national sentiments, but it is made all the more compelling by the emergence of new democratic governments in the region. By guaranteeing the security of our current allies and newly democratic nations in East Asia, the United States can help ensure that the rise of China is a peaceful one. Indeed, in time, American and allied power in the region may provide a spur to the process of democratization inside China itself. It should be noted that the paper’s reference to “the emergence of new democratic governments in the region” is a reference to client states created by the United States on behalf of its own interests and in no way constituted actual “democratic governments” which would otherwise infer they represented the interests of the very people possessing the “national sentiments” that opposed US military presence in the region in the first place. It should also be noted that in 2000, the United States was cultivating a number of such proxy governments across Southeast Asia including Aung San Suu Kyi and her National League for Democracy in Myanmar, Thaksin Shinawatra in Thailand, and Anwar Ibrahim in Malaysia. Since 2000, all but one of these proxies have been removed from power with Anwar Ibrahim residing in prison and Thaksin Shinawatra fleeing Thailand to evade a 2 year jail term. 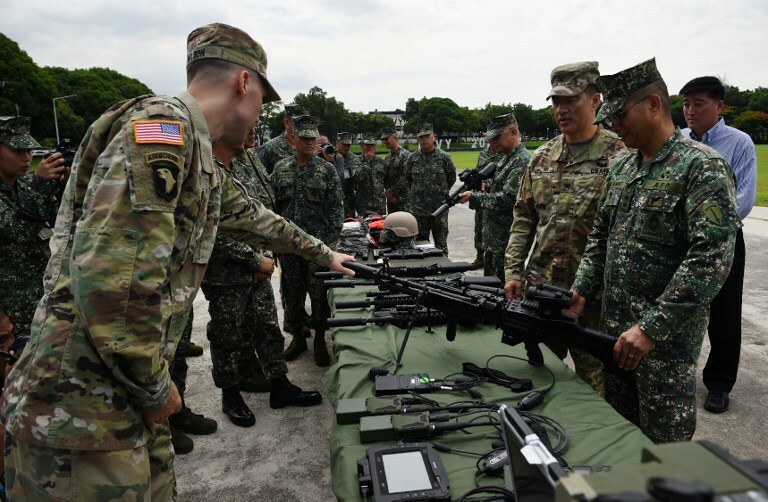 In the Philippines, attempts by the US to reestablish its military presence and use the nation in its self-serving, elective conflict with Beijing has suffered many setbacks. Most recently Washington found its relationship with Manila unraveling irrevocably in favor of Manila’s increasing ties with Beijing. This was until the fortuitous arrival of militants from the so-called “Islamic State” on the nation’s shores, overwhelming an entire city in the nation’s southern region. Such terrorists – however – have not simply sprung from oblivion. Such organizations conducting operations on the scale seen in the Philippines, southern Thailand, Malaysia, Indonesia, and Myanmar require immense sums of money, organizational capacity, logistical, and political support. And indeed, it is confirmed that not only does such support exist, it flows from a very logical and familiar source of state-sponsored terrorism – America’s oldest and closest ally in the Middle East – Saudi Arabia. Now this immoral policy has created a violent backlash. The world’s newest Muslim insurgency pits Saudi-backed Rohingya militants against Burmese security forces. As government troops take revenge on civilians, they risk inspiring more Rohingya to join the fight. Called Harakah al-Yaqin, Arabic for “the Faith Movement,” the group answers to a committee of Rohingya emigres in Mecca and a cadre of local commanders with experience fighting as guerrillas overseas. Its recent campaign—which continued into November with IED attacks and raids that killed several more security agents—has been endorsed by fatwas from clerics in Saudi Arabia, Pakistan, the Emirates and elsewhere. Rohingyas have “never been a radicalized population,” ICG notes, “and the majority of the community, its elders and religious leaders have previously eschewed violence as counterproductive.” But that is changing fast. Harakah al-Yaqin was established in 2012 after ethnic riots in Rakhine killed some 200 Rohingyas and is now estimated to have hundreds of trained fighters. The foreign-baked terrorism sponsored by Saudi Arabia and literally directed from within its own borders all-too-conveniently creates a pretext for US military presence in Myanmar it otherwise could not justify or in any shape, form, or way pursue. A similar superhighway of cash and weapons flows from terrorists operating in the Philippines to Riyadh and its partners in Washington, resulting in a similar opportunity for the US to establish a permanent military presence there in reaction to a crisis of its own intentional engineering. While the US proposes an expansive US military presence across Southeast Asia for “counter-terrorism” assistance, it is clear that it is Washington’s own aid and support to Riyadh that is at the very source of the security crisis and that simply withdrawing aid and penalizing this state sponsor of terrorism is the solution. Yet the United States is not making this most logical of conclusions, nor is it taking this most obvious course of action – indicating full complicity with Saudi state-sponsorship of terrorism and placing responsibility for the death and destruction sown by terrorism across Southeast Asia squarely on Washington. While the US frames its military presence in Southeast Asia as a cornerstone of peace and stability, it is in fact a policy representing a symptom of the sort of very real instability and chaos the United States and its self-proclaimed “international order” represents. It is particularly ironic that not only is the increasingly rampant terrorism across Southeast Asia a result of intentional Washington policy, it is being used as a pretext for setting the stage of a greater and potentially more devastating regional conflict with China.